This is my first ever Collabmas. This week I am collabing with on of my first blogger friends Guilianna from Guilianna Marie, click HERE for her post. I feel as if I am not the hardest person to buy presents for as I am into a lot of things so unless you get FIFA for me! So this is my Christmas Wishlist. I am sick and tired of my slow and old Vodafone Smart 3 and I feel I need an upgrade. I know I am definitely not going to get an iPhone as they are really expensive (€400 *gasps*), I already have an iPod (which I love) and I want a phone that is strong enough that when it does get the occasional fall, it wouldn't look like I threw it off a 10 story building. I am thinking of getting a Samsung Galaxy Prime (which is €130) as I know Samsung is a good brand. As you know, I love me some makeup. 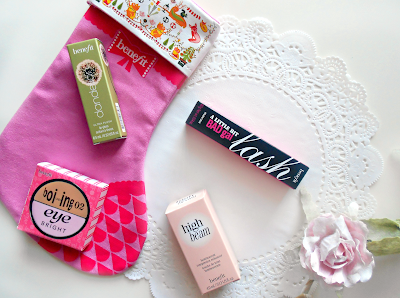 I am in love with the Benefit Christmas gift ideas, the packaging is goregous but one thing I saw in Boots was a little Benefit stocking and you could pick 4 mini sized products for €20! It is just so cute! The last one of these I got was last Christmas and I love how diverse they are, you can get songs, apps, ebooks, movies, audio books and TV shows. This is one thing I know I won't get as I have no idea what sort of Digital Bridge Camera I want as there are so many of them. If you know of a digital bridge camera that has good specs, price range under €250/$260/£200 and doesn't use AA batteries (I hate them cameras), please comment as in the future I would really like a nice camera that didn't cost an arm, leg or iPhone! I hope you have a very Merry Christmas and a great new year! Thank you Sanjara, Happy Christmas to you too! Merry Christmas to you too, Clare. I have tried to stay out of his way and so far I have been successful. Thank you Aoife! That's great advice and I will use it.